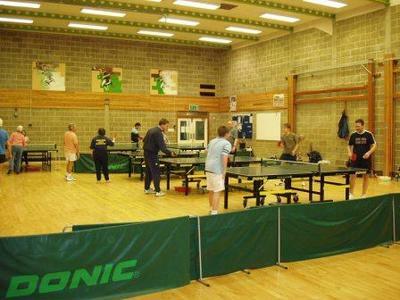 Stowmarket Table Tennis Club is in Stowmarket in the middle of Suffolk in the UK. We welcome visitors of all standards to our club. Our main venue is at the Stowupland High School, Church Road, Stowupland but we also have some sessions at St Peter's Church Hall, Milton Road North in the centre of Stowmarket. Non-members pay £3 or £4 depending on the session (members £2 or £3). There are different classes of membership for Juniors, Adults, Seniors and families - for example, a standard adult membership is £17. St Peter's Mon 10:30-12:30 and Thurs 1:30 - 3:30pm (over 50s). We have 4 tables at St Peters and up to 12 at Stowupland. Our tables are all in pretty reasonable condition, lighting is good and generally it's not too crowded. At the moment we have over 90 members of all ages and standards and have 6 teams entered in the Bury St Edmunds & District League and 5 Junior teams in the Suffolk & Cambs Junior League. We are a friendly community based club that welcome all players whatever their age or ability. 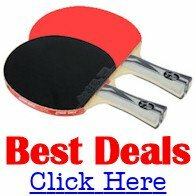 We have plenty of equipment - tables, bats, balls, robots and other coaching aids. 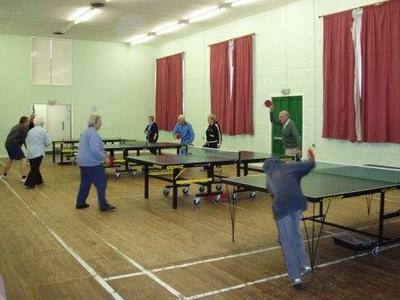 As recently as 2001 there was a table tennis league based in Stowmarket which had 3 or 4 divisions at various times. 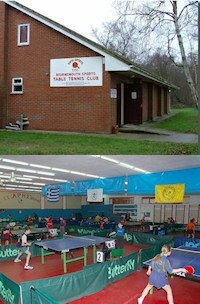 Over time, clubs pulled out of the league, which eventually folded, and the Stowmarket Club was formed. We offer coaching for juniors and adults and have 4 ETTA qualified coaches. The times of the sessions can be seen above.